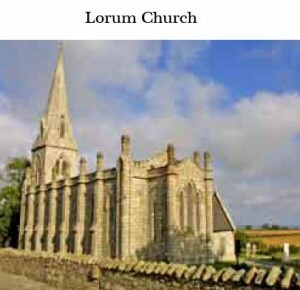 Church of Ireland church Evidence of three different churches can be found on thesite at Lorum. The nineteenth-century seven-bay church stands on elevated ground in astriking setting about 3.5 km from the River Barrow. It was built about 1838 to the designof Frederick Darley who also designed the gate piers which reflect the detailing of thechurch. Close by are the remains of an eighteenth-century church while to the south andeast of this building are the barely discernible traces of a much earlier church. 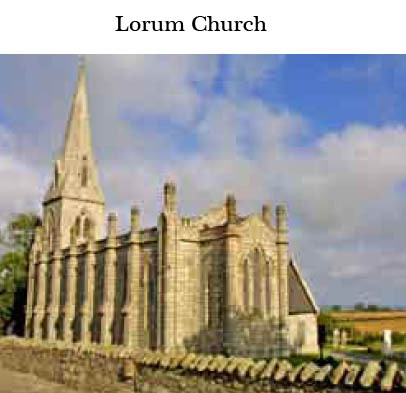 Directions to the next site: From Lorum Church continue straight on for 1km. Turn right for 3.8km until you reach a stop sign. Turn left at this cross roads for 1.6km, taking a right hand turn signed Templemoling Cemetery. 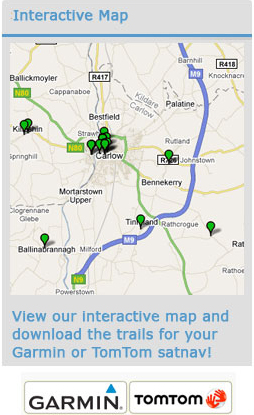 Continue for 3.8km until you reach Templemoling Cemetery on the left hand side. Distance 10.2km.